Congratulations on your admission to the UW Department of Epidemiology! We hope you will join us on February 28, 2019 and March 1, 2019 for Visit Days. This two-day event will give you the opportunity to meet members of our faculty, students, and staff; learn about your degree program and the exciting research being done in the department; tour the beautiful UW campus; and explore the vibrant city of Seattle. Pick up your Visit Days materials and get acquainted with the Epi Student Commons. If you arrive on campus between 10:30 am and 3:30 pm please come to room F263 to check in. The Health Sciences Building can be difficult to navigate. Let us save you from a headache and show you where to go. This course is one of the core methodology courses you will be taking if you choose to study at the University of Washington. We strongly recommend prioritizing this opportunity for you to observe how one of our most popular courses is taught. The class is broken into two sessions. You are welcome to attend one or both sessions, as you see fit. Join members of the Dean's Office Staff for lunch. Introduction to the Strategic Analysis, Research & Training (START) Center. Again, this building is tough to navigate for a newcomer. Follow us, so you don't get lost. Celebrate your admission to our program and visit with fellow Epi admitted students, current students, faculty, and staff over snacks and beverages provided by the Department of Epidemiology. You may check in at the reception if you weren't able to check in earlier in the day. Kick off day two of Visit Days with a continental breakfast and an opportunity to continue to mix and mingle with fellow Epi admitted students. Epi Department Chair, Stephen Hawes, Epi Graduate Program Director, Stephen Schwartz, and Assistant Director of Student Academic Services, John Paulson will share information about the Department, our programs and curriculum, the research and work of our faculty and students, and opportunities available to you as a UW Epi student. This session is designed for you to ask questions about your program in a more intimate setting with Epi faculty, current students, and staff. Return from breakout sessions and join us for lunch provided by the Department of Epidemiology. Current students will give you a taste of the types of research going on in the Department through ignite-style presentations. During this session, you will have an opportunity to meet Epi faculty members representing a variety of research areas. Use this time to explore your research interests, learn about the faculty member's work and research opportunities they might have. This is not the place to ask about funding, rather it's a time to get familiar with faculty you'd be interested in working with. Later in this session, faculty, staff and current students will be available to answer any remaining questions you have, such as strategies to find funding, life in Seattle and at the UW, student leadership opportunities, and much more. Join us for a student-led tour to get acquainted with the UW Campus and buildings relevant to your degree program and student experience. The tour will end at our happy hour location. For students who chose not to go on the tour, a group will be leaving from the Epi Student Commons in the Health Sciences Building, Room F-257 at 4:15 PM. Culminate Visit Days and get to know current Epi students and faculty. No-host happy hour, light hors d’oeuvres will be provided. Students planning to attend Visit Days must register by Thursday, February 14, 2019. 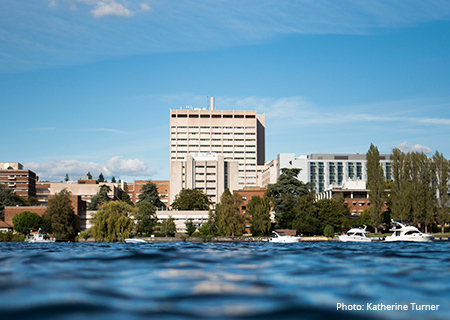 If your plans change after you have RSVP'd, please contact John Paulson at epi@uw.edu. You are responsible for making your own transportation arrangements to Seattle. We have limited travel funds to help offset the cost of airfare for a small number of students and will let you know if we can provide partial support. There are several ways to get to campus from the airport or wherever you are staying, including by light rail, bus, rideshare, and walking. Specific directions to get to our building can be found on our Visit Us page. A limited number of accommodations with student or faculty hosts will be available for those traveling alone. If you are interested in housing with someone from our department, please let us know when you register. If you'd like to plan for your own accommodations, there are several hotels around the UW campus to consider.